Mud agitator is a mixing equipment in various oilfield drilling mud system. It is mainly used to agitate mud to make it floating. Mud agitator is also an important auxiliary equipment in drilling mud solids control system. Aipu equipment adopts special structure to solve unsoundness seal problem. Aipu mud agitator has the advantages of low price, good stability, super shock absorption, small occupation area, smooth running, simple and convenient. The direct-coupled structure saves more intermediate link, so it is more reliable and simpler on performing. The speed reducer and explosion-proof motor combination can be maintained easily and can meet operating requirement in wild and rough topography. There are different types mud agitator in the oil drilling solid control system, vertical and horizontal are the two most common types. Different agitators offer different function. For example, planet agitator has strong convection which makes deposition of solid particles uneasy. Pipeline agitator can keep fluid moving continuously and it will not stop stirring fluid during the transaction. Mechanical mud agitator includes gearing, mixing shaft and impeller. Mud agitator is composed of several different parts, each part of them is equally important, if you want to get a perfect performance mud agitator, you need to select its components carefully, the selection on its components is also worth your attention. Mud agitator can be used widely in various applications, including drilling mud mixture, chemical industry, food or beverage, etc. In order to improve working efficiency and save cost, you had better to choose a suitable mud agitator according to actual working conditions. To select mud agitator we should know the process program, mud agitator is composed by explosion proof motor, reducer, engine base and impellers. The impeller can mix liquid to produce then becomes vortex motion, enhancing the mixing effect. Caught in the middle of the blade tray can also prevent particle in mud depositing, which is at lower levels under leaves. Such operation can reduce the starting resistance torque of sediment on the blade, thereby, avoid motor overload and burnout. If you can clearly understand how mud agitator works, I believe choosing a suitable mud agitator for you will be not a difficult problem. 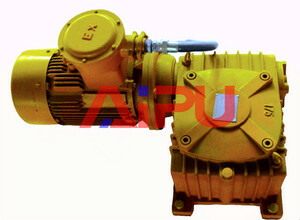 Please contact Aipu equipment to get more solutions for mud agitator. Aipu solids control possesses an unparalleled ability to design, manufacture, and provide aftermarket service for a wide variety of drilling mud systems and equipment. How to select a suitable drilling mud cleaner?